(TibetanReview.net, Mar20’16) – More than 90,000 exile Tibetans living in free countries across the world are voting today to elect their administrative head and political leader, called Sikyong, as well as members of their 45-member parliament, both based in the hill town of Dharamshala in the north Indian state of Himachal Pradesh. This is the second direct election by exile Tibetans of their political leader and the 16th election of their parliament. The voter turnout during the preliminary poll, held in Oct 2015, was reported to be 47,105. The current Sikyong Lobsang Sangay and the Speaker Penpa Tsering are the only candidates shortlisted by the Tibetan election commission for the Sikyong election after the preliminary poll results while for the parliament election there are a total of 94 candidates, including a few voluntary candidates. Both have a term of five years each. 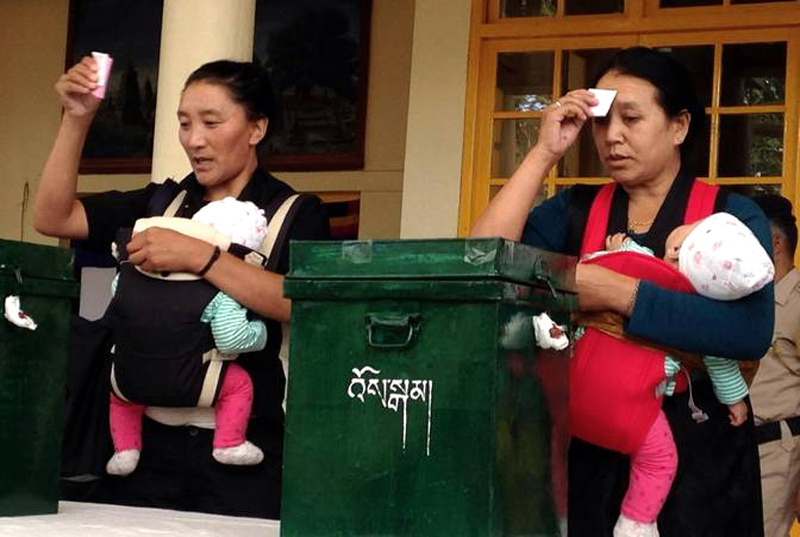 For the parliament election, Tibetans in India, Nepal and Bhutan will vote for candidates to represent their traditional provinces in Tibet, namely U-Tsang, Dotoe (or Kham) and Domey (Amdo). Each province has 10 seats in the parliament irrespective of the number of voters from each province. In addition, the monastic community has a second vote to elect two members each to represent the four major schools of Tibetan Buddhism and the pre-Buddhist Tibetan religion Bon in the exile parliament. For the remaining five seats, Tibetans living outside India, Nepal and Bhutan vote for candidates to represent them on the basis of their current geographical location, with two seats each for Tibetans living in Europe and North America and one seat for a collective of those living in Australasia and Asian countries other than India, Nepal and Bhutan. Local Tibetan election commissions around the world are expected to begin announcing the local poll results from the afternoon of Mar 21, although the final, combined results will be announced by the Tibetan Election Commission at Dharamshala only on Apr 27. The exile Tibetan population is estimated to be around 150,000, with about 100,000 living in India and the rest in over 30 other counties. Successive The Dalai Lama reincarnations had been the temporal head and spiritual leader of Tibet since 1642. In 2011, the current Dalai Lama, the 14th, formally devolved the temporal powers of his institution to an elected Tibetan leadership in the final stage of his move to fully democratize the Tibetan political system.